Mix and Apply NPK fertilizer at a rate of 20 grams per meter square meter. Make shallow furrows 15-20 cm apart. Mix the seeds with dry ash, sand or soil at a ratio of 1:3 to help spread the small seeds. Plant the seeds and cover lightly with soil and apply mulches (Grass or Polythene cover spread over the soil on the nursery bed). 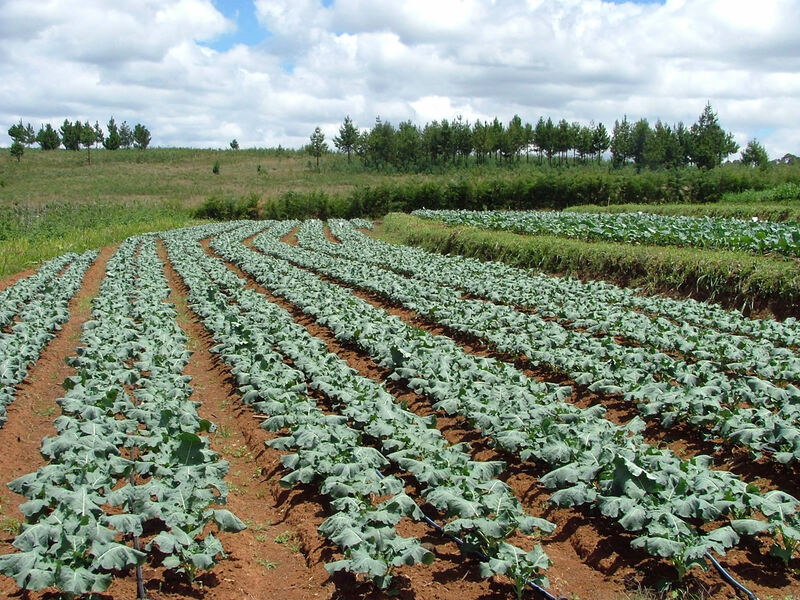 After planting irrigate the nursery bed liberally for the first 10 days and continue watering regularly. Transplanting of the seedlings takes place 6 weeks after planting seeds in the nursery. Transplant when the seedlings have pencil thick base and a height of approximately 15cm. Seedlings should have 3 to 5 well-formed leaves at transplanting time. Two weeks before transplanting reduce the shade to improve seedling survival rate in the field. Make sure you water the crops before transplanting. Onions need high Nitrogen scores. Top dress it with 3 weeks after planting and again after the 7th and 8th week. Make sure you water them after top dressing. Wait about 4-5 months for onions to mature. Stop irrigation 15-20 days before harvesting. Growing onions from sets is the easiest way to grow onions. Sets are dry onion bulbs harvested the previous year and have a higher chance of all sets sprouting. This is done by pushing the set into dump soil until the top is visible and the onion will grow quickly. One of the disadvantages of sets is that it is not easy to tell what type of onion variety you have apart from it being either red onions or yellow onions. Round onion sets will produce flat onion bulbs while elongated or tear shaped onion sets will produce round onion bulbs. Larger sets are best used as green onions while small sets are best left in the ground to form bulbs. Usually onions do not flower unless grown from sets. Purple blotch and blight are caused by fungus, with blight appears as whitish spots surrounded by a greenish halo. Purple blotch causes a purple discoloration of leaves. It is a disease that often appears on leaves that have already been damaged by other diseases or environmental factors. The spots form into oval lesions that have a purplish tint with concentric rings. Mix 12g (1 tablespoon) Control with 20L of water in a knapsack. Spray your onion plants 12 every 14 days. Downy mildew attacks onions in many parts of the world. It can become severe on leaves of commercially grown onion plants and on leaves and seed stalks of onions grown for seed, especially when relatively cool, moist weather prevails. It is characterized by pale–green, yellowish to brownish areas of irregular size and shape (oval to cylindrical) on infected leaves or seed stalks. These areas may consist of alternating yellow and green layers of tissue. The masses of spores are at first transparent to greyish, and then rapidly become violet in colour. Thrips are the most common and serious insect pest of onions, and are found wherever onions are grown. They are light-brown in color & are approximately 1mm long. High populations of thrips can reduce both yield and quality of onions. Thrips are most damaging when they feed during the early bulbing stage of plant development. Scarring of leaves is a serious problem on green onions. Kill thrips with both Nimbecidine and Final Flight . Mix 30ml Nimbecidine with 20L of water in a knapsack. Spray the plants 15 days after planting. Repeat every 15-20 days. Mix 4g Final Flight with 20 litres of water in a knapsack. Spray when you see thrips. Repeat every 10 days. Onions are fully matured once the top part of the plant (leaves) has fallen over. When the leaves have fallen you should harvest 10 to 14 days later or else they are likely to start to rot or start to grow again. Harvest onions in the morning on a sunny day. After pulling the plant from the ground, allow the onion to dry then clip the roots and cut back the top to about 1 inch. Cutting near the neck of the onion increases the likelihood of disease infection. They must be dried thoroughly to avoid problems with rot. The entire neck (where the leaves meet the bulb) should be dry, all the way to the surface of the onion, and shouldn’t “slide” when you pinch it. Always carefully handle onions to avoid external and internal damage, especially when loading them onto the hard surfaces Avoid walking and standing on bags of onions. The curing process for onions is important. This should be done in order to increase their shelf life. You should cut the leaf from the bulb and leave less than half a centimeter of the Dry it in the sun until it the onion skins dries and becomes uniform in colour. Grade the bulbs according to shape, size, colour and quality. Store well-cured onion bulbs for up to 6 months in a clean, cool, dark and dry place. Store in net bags, not sacks.